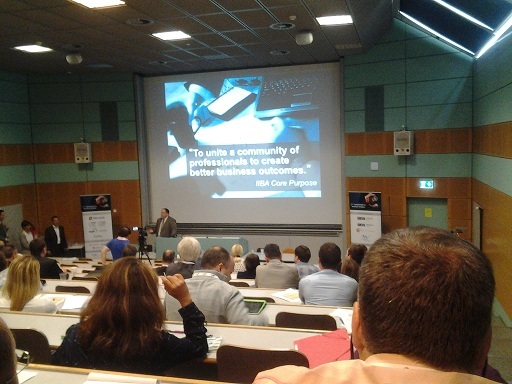 On June 30 we flew with the business analyst team of USG ICT Professionals to Geneva to attend the BAFS 2014 Symposium. An international conference on business analysis organized by IIBA France and IIBA Geneva. Of course we were teased by well-known speakers like Kevin Brennan and Kathleen Hass, but we appreciated as well a lot of other presenters on a variety of BA topics. For me, the most important presentation was the one given by Kevin Brennan on the new BABOK v3. I like the idea that the role of the business analyst is restored by IIBA from pure ‘solution requirements manager’ to ‘business value creator’. This is reflected in the new BABOK: the focus is now on creating business value! However, nowadays most organizations consider the business analyst as a requirements engineer only: the person who is responsible for trying to find out what a solution should be capable of and how the solution should look like. This is definitely a missed opportunity and a waste of talent: many organizations involve the business analyst not to define the problem or business opportunity, but to design the solution only. I am interested to know about your experience. Does this sound familiar? Are you involved in defining the business problem or opportunity? How would you persuade top management to get the BA on board much earlier in the decision process?